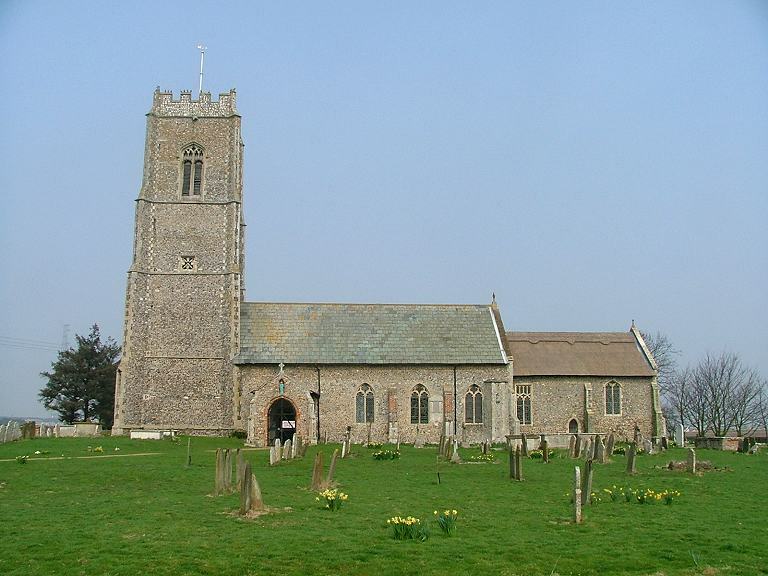 Bacton, in the middle ages, was home to Broomholm Priory, possessor of a substantial piece of the true cross and one of the largest pilgrimage centres in East Anglia. Today, it is home to the North Sea gas terminal, one of the largest industrial complexes in East Anglia. Sic transit gloria mundi. St Andrew sits out in the fields to the west of the little town - you pass the Priory gateway to get there. If I'd been expecting anything of the grandeur of Broomholm, or, indeed, the epic scale of the gas terminal, I would have been disappointed. But it was pleasant to find St Andrew set quietly back in the fields, among cottages where narrow lanes meet. You can just about ignore the terminal beyond. The tower is quite something - this is actually a fairly small church, but substantial bequests in the mid-15th century gave it a tower with a presence not quite up to the scale of Happisburgh, but in a similar style. The body of the nave and chancel also appears to be basically 15th century. Why so small? Perhaps the powerful presence of the neighbouring Priory made it unnecessary to have anything bigger. It has to be said that St Andrew was overwhelmingly restored in the 19th century. This is, to all intents and purposes, a Victorian church in a medieval shell. But it is bright, and very welcoming: church open, shouts the sign in the porch, although perhaps the bright green statue of St Andrew in the niche above shouts louder. There are a couple of medieval survivals; the font is absolutely gorgeous, a reminder if you needed one of the sheer opulence of late medieval East Anglia. A stone figure, perhaps of an evangelist, is propped up in a corner of the sanctuary. We wondered if it might have come from the Priory, but Mortlock says it is one of the pinnacles from the tower, as at Ridlington. Otherwise, this is a mellow, colourful place with an agreeable clutter, where little seems to have happened since the 1890s. The east window glass is good; I particularly liked the Presentation in the Temple. A battered, fading brass plate tucked behind the chancel arch records that this flag belonged to HMS Cormorant Commander Armine Woodhouse RN. She was destroyed by the Chinese in the attack at the Tako forts on the Peiho River June 25th 1859. Captain Wodehouse sunk under an attack of fever produced by exposure and anxiety consequent on the loss of his ship and died November 19th 1859 aged 36. The flag appears to have gone. Later, I found a reference to Wodehouse in Mee's King's England. He had been the Rector's son. The Cormorant was a gun boat, taking to Beijing a treaty opening up trade between China and Europe. The flag was a sign of official protection, but the soldiers in the Tako forts didn't recognise it, for whatever reason. Several years of war followed. While we were in the church, the curate came in, and was very encouraging, telling us quite how committed the parish is to keeping the church open every day. Another safe haven for strangers and pilgrims.